The Deptford Municipal Building is in the midst of getting a much overdue facelift. The goal is for the renovations to add more space and efficiency, while helping improve the workflow. The construction began upstairs. Mayor Paul Medany is especially proud about the renovations and what they mean going forward for the building. “We started upstairs because the construction office is so busy,” he said. He explained the process was in getting things updated. “What we did, there was a counter, we made that more efficient. We opened the space so that all the employees have brand new workstations now. A lot of the furniture was dated back to the 1980s,” said Medany. The outdated space and furniture were contributing factors to pulling the cord on the change. The building was built in 1979, and over the years the township has done cursory things to keep up appearances, like replace carpets and paint, but officials would have liked to have made a significant change earlier. The renovations have led to a more extensive cosmetic change by taking down walls and making the space more scenic. The renovations are believed to save up to 20 percent more space. Medany talked about how the increased traffic in the building led to a decision. The number of residents, business people and departments in the building have made it feel a little cramped, the mayor said. For example, adding up the number of residents, business people, developers, planning, zoning, the tax office, finance and the clerk’s office, there was a lot of traffic for the building to accommodate in its previous state. The timing of the renovations was fortunate because there were plans in place for a long time. “It’s one of those things that gets away from you,” said Medany. “You think you’re going to do it, and finally we put money in the capital (budget) last year, so we’re spending last year’s money, and we did it.” The renovations cost approximately $300,000, including heating and furniture, according to Medany. Contractors are currently working on the space. 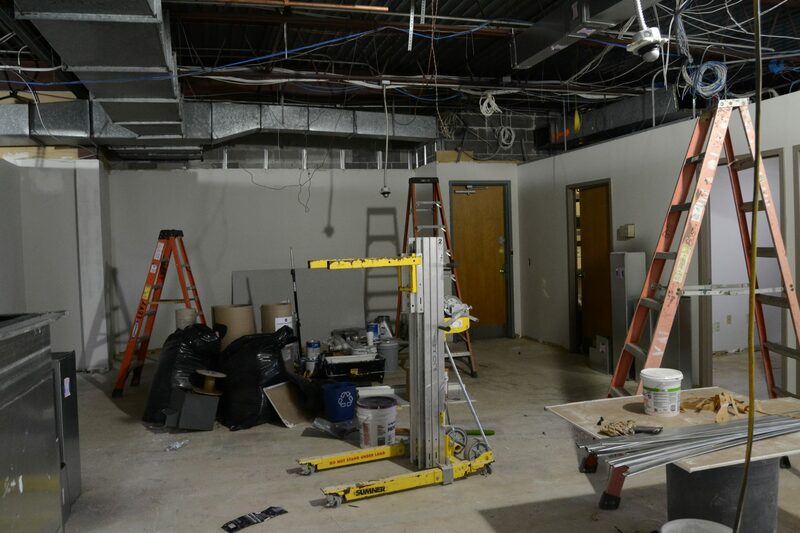 The work has caused a bit of an office shake-up with some departments having to vacate their space due to construction. The completion date is expected to be May 15.